Everyone's favorite nursery rhyme characters come magically and musically to life in this animated adventure based on the classic holiday tale. Opposing the evil Barnaby, Ollie Dee and Stanley Dum try and fail to pay-off Mother Peep's mortgage and mislead his attempts to marry Little Bo. Enraged, Barnaby's Bogeymen are set on Toyland. Mary: [an army of goblins arrive at the town gate] Tom, it's the goblins. Tom Piper: That's impossible, who lead them here? Barnaby Crookedman: [to the Goblins and tipping his hat] Welcome to Toyland. 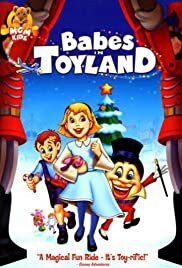 Judging from the low rating and some of the comments, as well as some scepticism of the idea working in an animated film, re-watching Babes in Toyland for the first time since goodness knows how long was either going to be better than remembered or be a disappointment. Seeing it, I was really pleasantly surprised, Babes in Toyland is so much better than anticipated and was actually a good movie, apart from the poorly drawn characters of Rodrigo and Gonzargo and the story dragging a tad in the middle. Of the four Babes in Toyland films, an unpopular opinion as this may seem this is second only to the wonderful Laurel and Hardy film, the Disney film was decent but one of the lesser live-action musicals and the 1986 version was mediocre at best overall with a lot of bad. The animation on the whole is bright and colourful- the backgrounds and colours are a treat for the eye. And none of the rest of the character designs being distractingly bad(Mary, Humpty Dumpty and Barnaby are fluidly drawn), Toyland just looks so inviting and full of life, with the goblin scene genuinely creepy-looking(but it is not that upsetting or traumatising). Regarding the songs they are just great with meaningful lyrics that say a lot especially the joyous and very catchy Toyland and the sublime duet It's You. March of the Toys was very rousingly orchestrated and served very well with the edge-on-your-seat finale. The only exception for me actually was A Crooked Man, which was rather forgettable and didn't tell or say very much(The Worst is Yet to Come did have its moments though it was slightly at odds with the style of the rest of the songs). Above all the singing is at the very least listenable(though Christopher Plummer basically speak-sings through A Crooked Man, though it probably did fit the song), Cathy Cavadini's amazingly beautiful voice in It's You deserves a big mention and Raphael Sbarge's is strong and sturdy. They also, unlike something like Quest for Camelot, match the speaking voices(helped by that the voice actors sing their own music), for example Lacey Chabert singing in Dream sounds exactly like Lacey Chabert when she's speaking. Mark Watters' score is dynamic, memorable and lovingly compliments the mood of the whole story, not all the films that he writes for are great but his music is always one of the best assets. The script is never cloying which considering one of the material here was a big trap to fall into but has its fair share of heart-warming moments. The conflict is clear while not being too over-prominent and without making the film uneven, if there were any mean-spirited moments they weren't obvious to this viewer, while the 1986 Drew Barrymore version was full of them. The story, a loose adaptation and with some influences of Mother Goose, structurally is not an exceptional one and is a tad thin on the ground, however the real sense of charm and innocence and the warmth and magic- you actually want to live in Toyland- as well as what the characters go through surprisingly really draws you in. The romance between Mary and Tom is sweet and takes its time to develop, none of the love at first sight stuff. In fact the characters mostly are very interesting, I found myself identifying every step of the way with Jack and Jill, they are cute but with enough backbone to not sugarcoat things, that they are determined and well-meaning makes them even more likable. Humpty Dumpty serves as a warm-natured narrator-character. Barnaby, looking like Moundshroud's(The Halloween Tree) long lost brother and acting like an even meaner Ebeneezer Scrooge, is a sinister villain but despite his appearance his villainy is far more subtle than in the Barnabys in the Disney and Barrymore versions(which veered to over-the-top, admittedly though in an enjoyable way). The goblins have a real creepiness. How the characters interact are also revelations, Mary and Tom's romance is the highlight though Barnaby is a very believable threat to Jack and Jill(who genuinely care for one another and also for Mary and Tom and the factory). Rodrigo and Gonzargo are the only not-so-interesting characters and that's mainly down to not enough screen-time, there's also the sense that they weren't even needed.